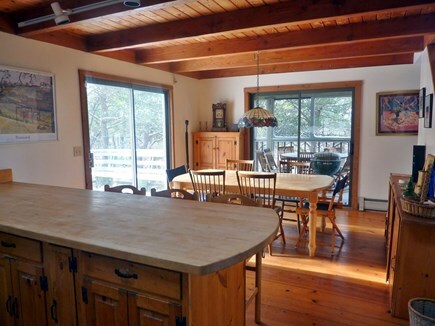 4 bedroom, 2 1/2 baths, walk to bay beach in minutes. 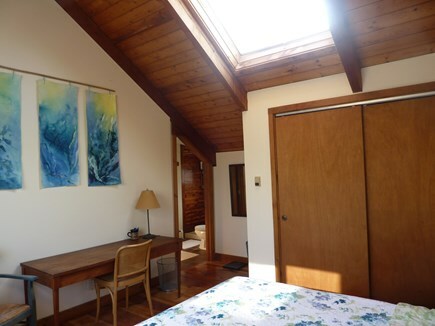 Surrounded by trees and shrubs, in a private and quiet setting, this warm and inviting, light-filled contemporary is less than a 10 minute walk to beautiful Great Hollow Beach. The house has been freshly painted and the wood floors redone. 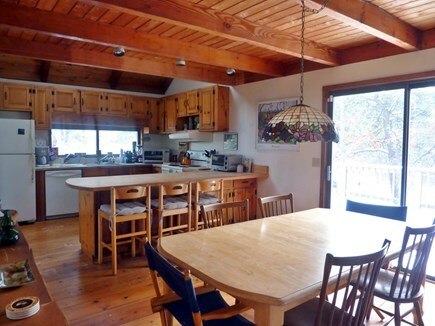 The large, open plan main living area has a double height ceiling in the living room, a warm inviting dining area, a fully equipped kitchen and a powder room. Glass sliders on one wall of the dining room open onto a large private deck. A huge screened in porch runs along the other dining room wall with access from glass sliders in both the dining room and living room. 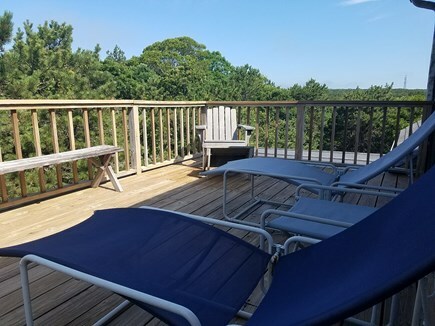 Upstairs you will find a very private master bedroom, with an A frame ceiling, full bathroom with a cedar lined shower, and sliders out to a large private deck with panoramic views. 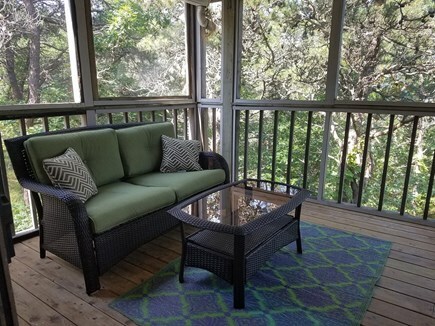 There is a small balcony and cozy study area overlooking the living room where one can sit and relax by the glass slider or get some paperwork done. 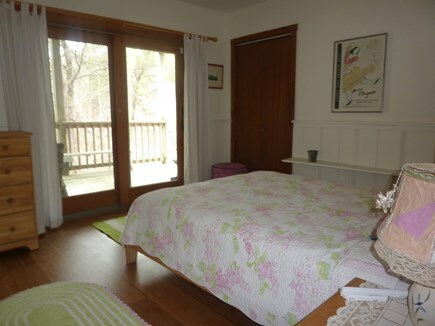 There are 3 bedrooms (one having an additional small bedroom with a twin bed, or play area attached to it), a full bath, and a laundry room on the lowest level. Two of these bedrooms have glass sliders going out to another small private deck. 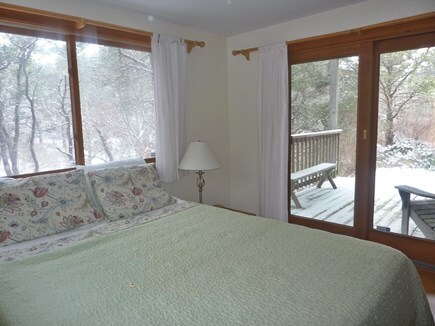 There is a large outdoor shower and a small deck at the front of the house. 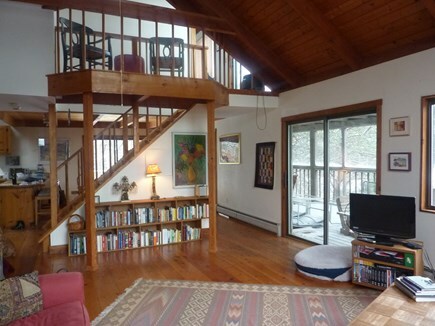 The house is filled with books and games and has high speed wireless internet and cable TV. 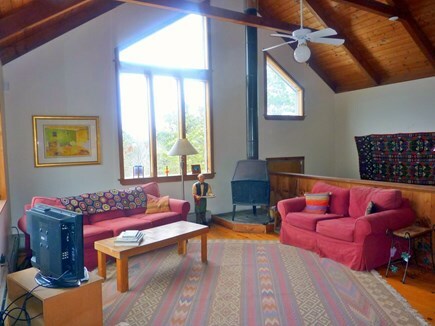 This is a Sunday to Sunday rental in order to help our guests avoid the long delays and traffic jams coming to and leaving the Cape on Saturday mornings and afternoons. 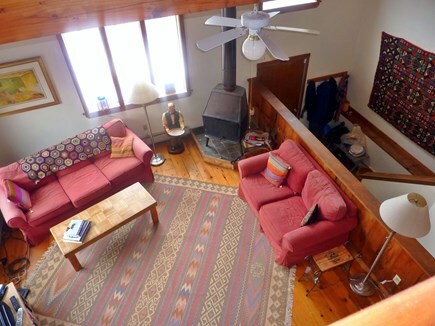 Additional pricing info: multi week discount available, State and local taxes of 12.45% will apply. I fell in love with Truro while vacationing here with our growing children and family; in fact, our whole family fell in love with it. After renting for many years, we finally found our wonderful house and bought it in 2013. Since then the house has become a much loved home and summer retreat. 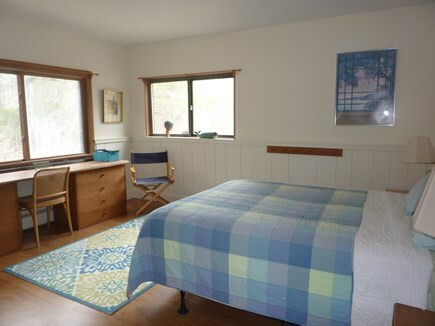 We enjoy many weeks each year in our home but offer it for rent for a number of summer weeks when we cannot use it ourselves. With lots of experience renting ourselves, we understand how important it is for an owner to be responsive to renters and any issues that might arise and to be honest about the house. You will find that I am easy to reach and will do whatever I can to solve any problem that might arise and to be helpful in any way that I can. 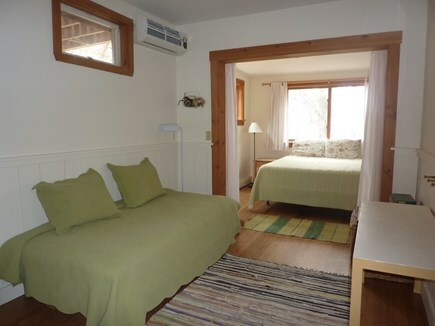 Our home is wonderfully warm and inviting, filled with light, comfortable and well equipped. 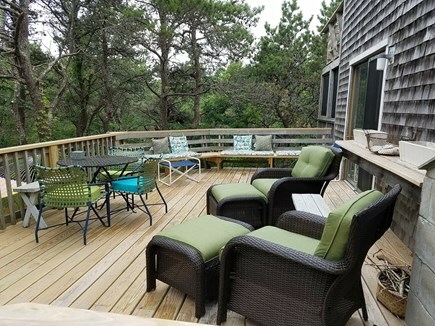 It has many very inviting areas to spend time in and on nice days, the many decks are glorious and private. 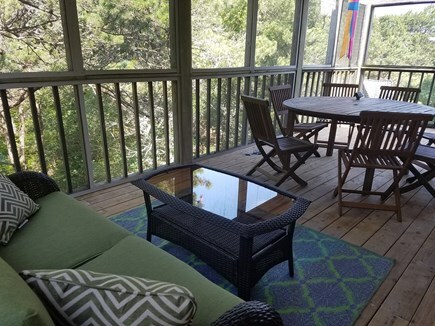 One of the nicest features is the huge screened in porch which is a wonderful place to spend time in; sit and relax, read, eat meals at the table or stay dry while you enjoy the outdoors on a rainy day. 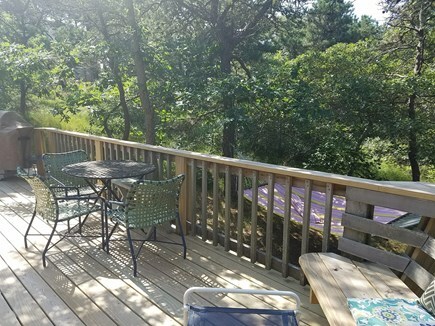 We keep the two large sliders in the living room and dining room open to the screened porch in the summer and there is a wonderful flow from outside to inside living space. 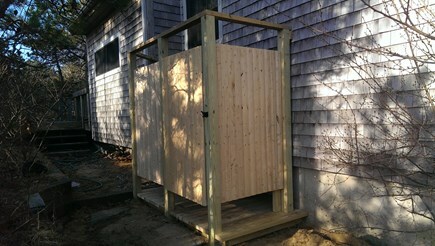 And don't forget the large, inviting, outdoor shower. 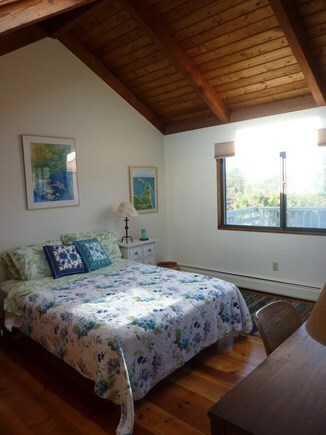 We also love the privacy of the house surrounded by trees and shrubs and the 5 - 10 minute walk to the beautiful beach. 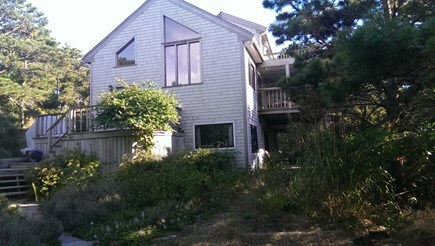 Truro is wonderful as it is much less developed than almost all of the Outer Cape. The beaches are rarely crowded and the magnificent dunes surrounding them are very special. 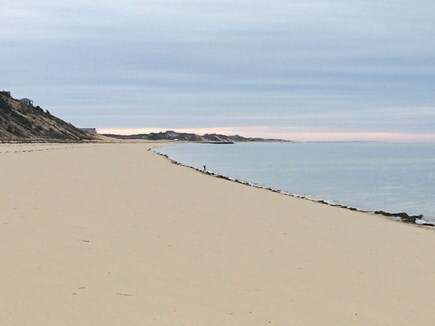 Nevertheless, you are 10 minutes from Provincetown and Wellfleet and all the commercial and artistic resources that are there.